ATLANTA, April 8 Delta Air Lines (NYSE: DAL - News) retired its remaining Boeing 727 aircraft today in its ongoing effort to simplify its fleet and improve operational reliability for customers. "The Boeing 727 served as an elegant and durable workhorse of Delta's fleet for more than 30 years. It was a vital part of our company's growth," said Frederick W. Reid, Delta's president and chief operating officer. "The retirement of the 727 allows us to simplify our fleet and realize the benefits of a more efficient fleet mix to better serve our customers." 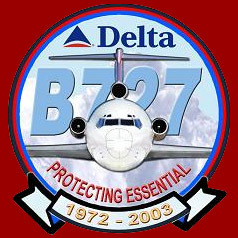 The Boeing Co. introduced the 727 in 1964. Delta introduced 727s into its fleet in 1972 and eventually acquired a total of 184 of the aircraft. "The 727 helped us build our strong relationship with Delta," said Mike Cave, Boeing's senior vice president of commercial aviation services. "Our long-term partnership will be key to our mutual success in the 21st century." Delta's last commercial 727 flight was flown from Greensboro, N.C., to Atlanta on Sunday, April 6, and marked the last scheduled airline flight utilizing this aircraft by a major airline. 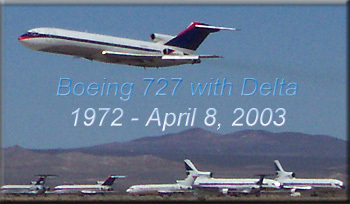 With the retirement of the Boeing 727 fleet, Delta now operates six aircraft types: McDonnell-Douglas MD88/MD90; Boeing 737 family; Boeing 757; Boeing 767 family; Boeing 777; and McDonnell-Douglas MD11. Delta will ground the remaining three MD11 aircraft this year, reducing the number of aircraft types to five by December 2003. Source: Delta Air Lines, Inc.